So the NCAA Championship game is finally upon us and March Madness is nearly at an end. Given that we are currently deep into April this is probably for the best but this is a tournament that can zip by rather quickly. Even with the week of preparation building up to the Final Four, this is a basketball tournament that can catch you unawares at times. Heading into the Championship match are Wisconsin and Duke, and it looks as though we are going to get a very close match. Both teams will be thinking that this is a game that they can, and there are plenty of reasons for both teams to be optimistic about their chances. In the end, it may come down to a single play, a single mistake or a sublime moment of genius that separates these two teams. This is exactly what you want from a Championship match and if you are looking to place March Madness bets, you may find it difficult to be 100% confident about any of your selections. If you want to win basketball games you need to score points and this is something that Wisconsin have in abundance. Frank Kaminsky has a record of 22.2 points per game and Sam Dekker stands at 20.6, and these two players are the two top scorers in March Madness this season. Kaminsky has had a tremendous campaign and he is definitely recognised as one of the leading players on the year in college basketball. Many people expect Wisconsin to approach the game in a mature manner, which is vital. It is understandable that defeating Kentucky would have put the players on a high but there is a need to get back to work as quickly as possible. There is no sense in defeating the tournament favourites and then falling down at the final hurdle yourself, and this is something that Kentucky will be more than aware of. You can expect the players to have pout Saturday’s win out of their mind and then they can push forward in the hope of achieving one more triumph. Duke know that they have already defeated Wisconsin this season, by 10 points back in December. The Badgers will point to the fact that Dekker was far from full fitness in that match but the result is in the record books and it should provide Duke with some confidence. Duke also have some big players of their own and Jahlil Okafor has impressed a lot of people, with his 18 points against Michigan State being a key factor of the game. With Justise Winslow and Tyus Jones adding to the mix, Duke have more than enough players who can do the damage in this game. 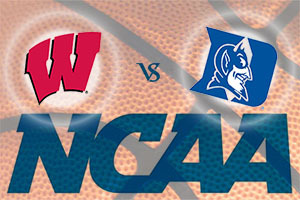 Duke are listed at +1, at odds of 1.90 while Wisconsin are listed at -1, at odds of 1.90, so there really isn’t a lot to choose between these two sides. The Over/Under market is currently being listed at 140.0 with odds of 1.90 on offer for bets OVER and UNDER this mark. Bet Now!